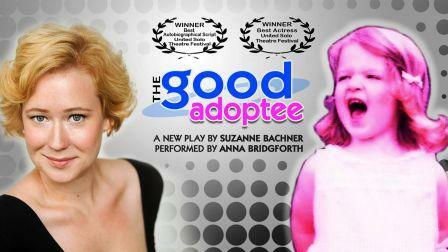 Suzanne Bachner’s award-winning show, The Good Adoptee, starring Anna Bridgforth, will tour Connecticut this fall to help garner support for restoring Connecticut adoptees’ access to their original birth certificates. The tour runs October 22 to December 9, coinciding with National Adoption Awareness Month, and will benefit Access Connecticut‘s adoptee rights efforts. Each performance will include a post-show Talk Back with creator Suzanne Bachner and actress Anna Bridgforth . The tour is cosponsored by Access Connecticut and Calo Programs. ⇑ Click for tix! Access Connecticut President and adoptee Karen Caffrey interviews Suzanne Bachner about what inspired her to write The Good Adoptee and the challenges and rewards of bringing her personal story to the public stage. Karen Caffrey: What inspired you to write The Good Adoptee? Suzanne Bachner: I wanted to tell my true story of the search for my identity in the face of New York State’s sealed records, and I wanted to dramatize the roller coaster moments of deep joy and pain, disappointment and triumph, and the absurdity and hilarity encountered along the way. As an adoptee, I found that not only didn’t I always have a voice, but that I had become the very agent suppressing that voice in being “The Good Adoptee”. I have always spoken up about injustices since I was a kid; it was time I did so about the injustice, layers and complications I was experiencing as an adopted person. I wanted to tell my truth and share it as a piece of art on stage that could be experienced in a dynamic and visceral way by an audience. Was it difficult for you to make your personal story so public? In this piece there is no distance or fictionalization. Everything in the play happened. I changed one first name and that’s it. When we were accepted into the United Solo Theatre Festival in NYC, where we premiered this work, I was ready to go public. But I was terrified. It was totally irrational, but on some level, I was afraid my parents would disown me. Because I ended up focusing the piece on my personal search for my identity, all of the parents in the play ended up having more supporting, minor roles. But my parents, who have always been incredibly supportive of me as an artist and had seen all my plays many times, even the very memoir-esque adoption themed plays, were coming opening night. My amazing actress, Anna Bridgforth, was going to be playing them, and I would be detailing the search in ways I hadn’t fully shared with them while it was going on in my life. So about a week before opening, I called my Mom and I said: “Mom, I’m afraid you and Dad are going to disown me.” She reassured me that that would never happen and that they had always loved my plays and after that, I was fine. The first show I was pretty much in Twilight Zone shock, but after we opened, I found a way to be present and comfortable in my own skin watching it and then I could enjoy it and see and hear the audience doing the same. Karen: What has most surprised you about audience reactions? How much they have laughed and enjoyed the show as well as having it “hit” them and move them and inspire them to action. I didn’t set out to write an activist piece per se, my job as a playwright was to tell this story in the strongest, most revealing and truthful way possible without burying the heart and vulnerability of it under explanation or apologies. What also surprised and thrilled me was how much audience members who are not in the adoption community related to and engaged with the piece. That is also something that I hoped to get across — that an adoption experience touches on so many universal issues that everyone deals with — the search for identity, love, connection and belonging. That adoptees are not The Other, that our experience is not totally alien to other human beings. Millions of people raised by their bios share the experience of having multiple parents through divorce and remarriage. Anyone at any time can have an existential crisis (maybe not as acute as that of an adoptee! ), but adoptees are sometimes forced to explore these life issues that effect us all. Will you write more plays about your experience as an adoptee? Yes! I have been writing adoption plays since I was 19. Originally, it was a way to safely explore adoption issues when I was not ready to do so in the real world, before I could give myself permission. I met my (fictional) birth mother in one of my plays when I was 26 and in Drama School. She was a figment (or phantom) conjured up by her daughter on the eve of her 30th birthday. She was a 52-year old woman inhabiting the body of 22-year old hippie. Unbeknowst to me at the time, she was the same age as my actual birth mother when she gave birth to me. My biggest surprise in writing the play was that the birth mom character told her daughter that she had been looking for her. That had literally never occurred to me consciously, that my birth mom could possibly be looking for me. I will probably always write about adoption. My mentor in drama school, Romulus Linney, basically told me I had very little choice in the matter: this was my dramatic material. No choice: so typical for an adoptee! 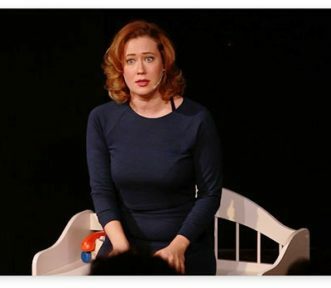 You and star Anna Bridgforth will be doing a Talk Back after each of the nine shows in Connecticut. What are some of the most common questions, or reactions, that people have shared during the Talk Backs? The scary and wonderful thing about Talk Backs is that you never know what is going to come up. The most common reactions from adoptees and parents in the adoption community is “I get it”, “I can so relate.” It inspires people to share their own experiences. With audience members beyond the adoption community, it’s one of empathy and self-recognition: they leave with a greater understanding of the issues and the complexities and contradictions of adoption. Everyone who has ever been placed on hold relates to fight against the red-tape restrictions and civil rights injustice. It has also inspired allies outside the community in the fight for open records and adoptee access to original birth certificates, which is terrific and fills me with joy. Audience members often ask about the process of creating the piece. Once I join Anna on stage for the Talk Back, many have a hard time believing that Anna isn’t me. All of a sudden there are two of us! She is an extraordinary actress and her performance is stunning. Many have said she truly “channels” me as well as the other characters, and it just feels like she lived this experience. I am so looking forward to her performances and the Talk Backs in the Connecticut Tour! Learn more at: TheGoodAdoptee.com and AccessConnecticut.org. This play sounds amazing. I wish I lived closer to Connecticut!